The Giro’s first major test arrives on stage 6 with the climb up Mt. Etna. Expect to see the GC riders show themselves on the long, steep ascent. First, the course covers hilly terrain as it crosses Enna and Piazza Armerina. After reaching Paternò, the route steadily rises for 25 kilometers with increasing gradient. Finally, the true climb begins in Ragalna. This new ascent of Etna begins on a narrow road, winding across lava flows to the Astrophysics Observatory, some three kilometers from the finish. The stage concludes at the Rifugio Sapienza, which has been the site of several past stage finishes. 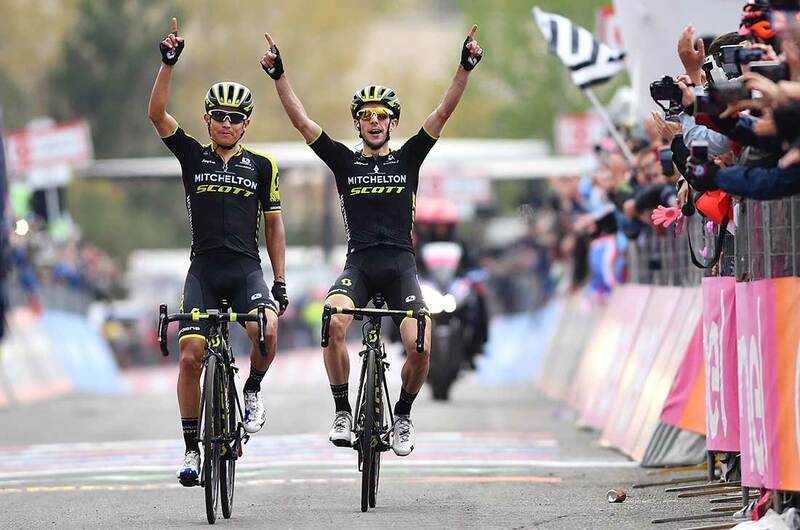 With a marvelous ride on Mount Etna, Mitchelton-Scott teammates Esteban Chaves and Simon Yates went 1-2 in Giro d’Italia stage 6 Thursday. Yates moved into the overall race lead with his heroics on the Giro’s first summit finish. Thibaut Pinot (Groupama-FDJ) won the sprint for third out of a group that included defending champion Tom Dumoulin (Sunweb) and Chris Froome (Team Sky). Dumoulin remained second overall, 16 seconds behind after the stage with Chaves third, 26 behind his teammate. 2. Simon Yates (Mitchelton-Scott), s.t. The Colombians were on the move early in the 164km stage with Chaves in an escape before the 15km final climb. Chaves was part of a large breakaway, along with Colombian champion Sergio Henao (Team Sky). The breakaway’s efforts were aided by Chaves’s Australian teammate Jack Haig who drove the pace in the breakaway. As Mount Etna proper began, Robert Gesink (LottoNL-Jumbo) attacked first from the breakaway. He wasn’t given much leash, as Ben Hermans (Israel Cycling Academy) and Alessandro De Marchi (BMC Racing) countered his move. Henao and Chaves were also eager to stay in contention. Their counterattack was next. With less than 10 kilometers left to climb, the lead had distilled down to Henao, Chaves, Giulio Ciccone (Bardiani-CSF), Sam Oomen (Sunweb) and Hermans. Ciccone attacked with 6.3km to go, and for a little bit, the Italian looked poised for a solo raid on Etna. However, Chaves bridged the gap and countered with 5km to go. Behind, in the reduced peloton, the key GC riders came to the fore: Froome, Dumoulin, and Fabio Aru (UAE Team Emirates) made the selection. Race leader Rohan Dennis (BMC Racing) was dropped and he would lose the pink jersey by the top of the 1,736-meter peak. Near the final kilometer, Yates swung to the right side of the road and looked over at the group that included Dumoulin and Froome. He saw the gap and took a chance with an attack. No one followed, and the Brit joined his Colombian teammate with about 500 meters remaining. The two crossed the line together, celebrating the stage win for Chaves and a pink jersey for Yates. “It’s like a dream, and now we go to the mainland with a good start and super excited and keep on dreaming,” said Chaves who also took the king of the mountains jersey. With a flat, 159-kilometer stage 7 on tap Friday, Yates should be able to keep his overall lead ahead of the weekend’s mountain stages.